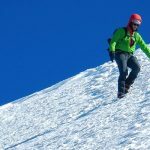 A great jacket for variable hiking and climbing conditions. 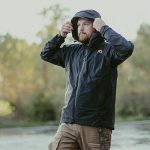 It’s got the waterproof chops to stop a downpour, but also enough breathability to be your go to shell in windy and cool weather too. While we'd like pit zips, most of the time we didn't miss them. An ideal choice as your only jacket on light and fast mission. Solid performance in a variety of conditions and a reasonable price from a trusted name equals excellent value in our opinion. Through hours of rain, blustery near freezing weather and an all day mist we didn’t noticed a single weakness in this jacket’s shield. The chunky, but easy running Aquaguard zip worked great and never leaked. The hood fit over a bike helmet and easily adjusted to stay in place even when heading into a gale. MH’s Dry.Q EVAP membrane works like a sponge on a tennis court after it rains. 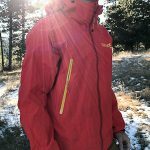 While the jacket does a good job of breathing on its own, the condensation that does form on the inside is dispersed across the micro-rugged interior surface for faster evaporation. We noticed the 2.5 layer membrane felt dry in all but really sweaty occasions. This is when we wished it had pit zips. Even cracking the front zip wasn’t enough to keep us comfortable when pedaling hard uphill. We found it worked best in less aerobic situations like hiking and climbing. Easily manipulated hood strings made it easy to adjust but stayed hidden in the jacket when not in use, keeping out of the way. The jacket fit a variety of sized testers from 5’7″, 140 pounds to 6′, 180. Even on the bigger tester there was room for extra layers and the sleeves never slide up exposing skin. Two big hand pockets fit tons of stuff and never interfered with a harness or pack hip-belt. The 15 Denier 2.5 layer fabric won’t be as durable as a heavier weight or even a similar weight 3-layer jacket. A brush with a blackberry bramble punctured the fabric. Treat it with care. Fantastic. The 7.7 ounces was near test leading and it packed down small like an orange, even though it had two hand pockets and a waterproof zip.